Climate, elevation- Prefers cool moist climates and can be found from sea level to 9000 feet. Local occurrence (where, how common)- In Washington this species can be found as a common component of wet communities, particularly at higher elevations. Mainly coastal Washington, the Olympics, and Cascades. Habitat preferences- Prefers wet environments. Found in wetlands, marshes, riparian areas, and around natural springs and seeps. Plant strategy type/successional stage- Undergreen willow is an early seral colonizer of areas disturbed by flooding or fire. Associated species- Often found with other willow species like Salix barclayi and Salix planifolia. Also associated with Carex scopulorum. Can also be found in subalpine communities with lodgepole pine, Engelmann spruce, and subalpine fir. Collection restrictions or guidelines- Seeds can be collected in early summer. Before collecting, capsules should be observed periodically to determine if they are mature. Cuttings should be ½ to 1 inch thick and 16 inches long. They should be collected while the plant is dormant, but if necessary can be collected later and planted provided leaves are removed. Dormant cuttings can be stored till needed. When using cuttings, care should be taken to distribute collection to avoid de-vegetating areas as well as to ensure collection of both male and female plants. Seed germination- Seeds germinate readily and do not need dormancy breaking. Seed life- Seeds have a very short storage potential, with viability decreasing rapidly after 10 days if not refrigerated. Recommended seed storage conditions- It is not recommended to store Salix seeds. If necessary, seeds can be stored for up to 6 weeks if processes, cleaned and refrigerated in sealed containers. Cuttings can be stored for several months provided they are kept moist, but not wet, in sawdust or other medium. If seeds are being used they should be sown immediately after collection. Cuttings can be planted into the ground with approximately 3/4 of the cutting below the soil surface. Soil or medium requirements- Seeds will germinate best on moist mineral soil. Cuttings do best in moist but not saturated soils. Success of cuttings can be enhanced by treating the cut end with rooting compound. Installation form- Stem cuttings are the easiest and most cost effective means of propagation. Cuttings grow quickly and have a high rate of success. Seeds can be grown to seedlings but seed availability is limited due to a lack of commercial sources. Care requirements after installed- Little additional care should be required after installation if planted in moist areas. Care should be taken to ensure that the soil around cuttings does not dry out. 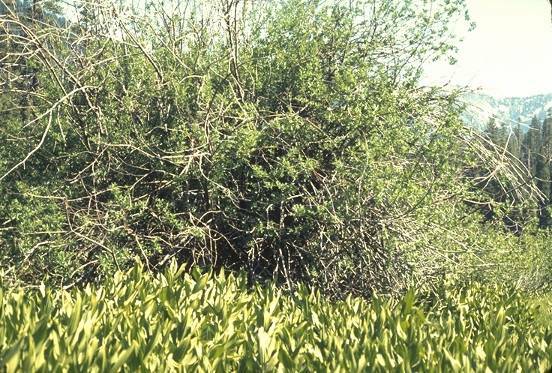 Normal rate of growth or spread; lifespan- Willows grow rapidly though are generally not very long lived. They tend to grow in clumps and easily spread by layering. National Forest. 3/21/2001. Viewed 5/12/2006. “Evergreen Native Plant Database.” Viewed 5/12/2006. “PLANTS Profile for Salix commutata.” USDA Natural Resources Conservation Service.